With all of Orlando’s main attractions right at its doorstep, the Grande Villas Resort is perfectly suited for vacationers longing for some fun at the theme parks. 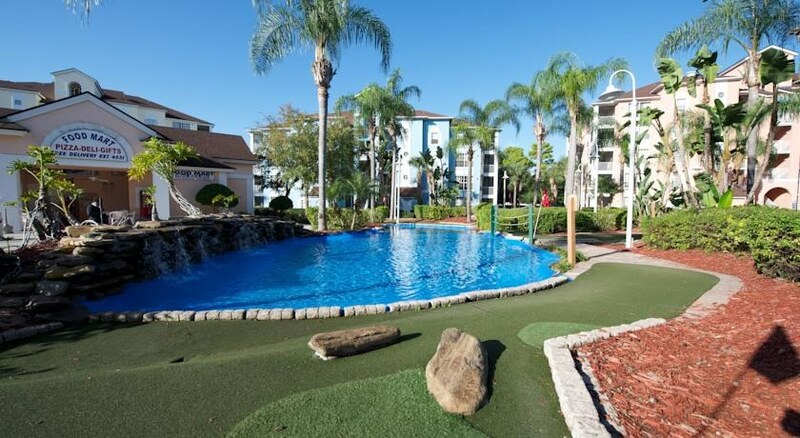 Situated just 20 minutes away from Orlando International Airport, the resort enjoys close proximity to Walt Disney Theme Parks, Universal Island of Adventure, Universal Studios and Sea World. However, this exciting range of choice isn’t limited to the resort neighbourhood only. Within the resort premises, guests can make the best of the water volcano and slide, children's pools and playgrounds, or relax by the outdoor pool area that comes decorated with an expansive mini golf course, a spa pool, a communal barbecue area, and a pizzeria/deli. Adding to the whole experience are the rooms of the villa that are designed for the guests to experience the delights of ultimate comfort. The Grande Villas Resort makes a great base for exploring Orlando as it lies within close proximity to all major fun parks in Orlando. The world-famous Disney World, SeaWorld and Universal Studios, Universal Island of Adventure, are within a 15-minute drive from the resort. Mary Queen of the Universe Shrine and Lake Bryan are also located nearby. 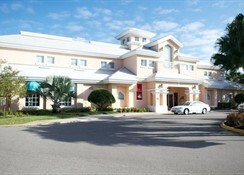 The Orlando International Airport is 20 minutes away from the resort. Guests at the Grande Villas Resort can feel at home in one of its 408 air-conditioned rooms spread over 5 floors that feature amazing panoramas. 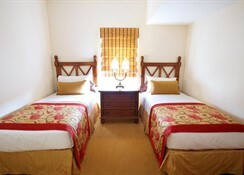 The guest rooms are elegantly appointed and have en-suite bathrooms with superior toiletries. The private balconies or patios attached to the rooms make the stay a delight while modern amenities like Wi-Fi, cable programming and iPod docking stations add to the entertainment factor at the Grande Villas. The attached kitchenettes come with refrigerators and stovetops and a dining area also forms a part of the package. 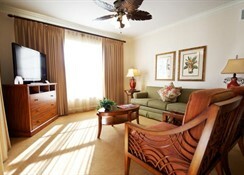 Other conveniences include safes and separate sitting areas, and housekeeping is provided on a limited basis. 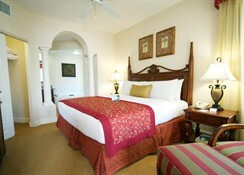 Grande Villa Resort offers limited poolside service. The sprawling outdoor pool area comes replete with a communal barbecue area, and a pizzeria/deli. The guests staying at the resort can make the best of the convenience store located at the main Clubhouse. Guests can also complete their day with a delicious dining experience at one of the many local restaurants lying in the surrounding Lake Buena Vista area. Some of the restaurants where guests can dine-in are Joe's Crab Shop, Macaroni Grill, and Olive Garden among the many other restaurants in the area. When at Grande Villas Resort, attractions like Walt Disney Theme Parks, Universal Studios and Sea World Fall within easy reach for the guests. At the resort, guests can choose to dip into one of the 2 outdoor swimming pools or enjoy other recreational amenities including spa tubs, outdoor freeform pools, outdoor tennis court, sand volleyball, shuffleboard, air hockey, a 9-hole mini golf course and a fitness centre. The resort also accommodates an arcade/game room, a water volcano and a slide, while for the young guests, the children's pools and playgrounds serve as a great option. 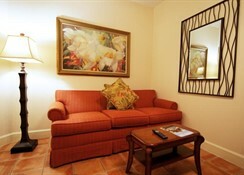 Grande Villas Resort is equally convenient for some superb shopping and guests can visit the nearby Florida Mall or choose from the numerous designer outlet malls that surround the resort. 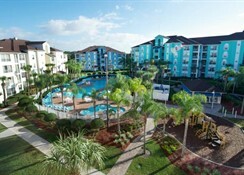 Grande Villas 12.50% $ 12.00 add tax 407-238-2300. There will be a minor construction project at the Grande Villas from April 2017 - September 2018 affecting the balconies of some of their suites. There may be limited parking in the affected area, as well as scaffolding and daily construction-related noise from 10am to 6pm.